Long, long ago, before I had a beard, I made a simple Lumber Storage Cart. It was one of my early YouTube videos, so if you’d like a good laugh, go check that out. But now that I have a bigger shop and more material on-hand, I need to make a bigger Rolling Lumber Storage Cart to keep it all organized. 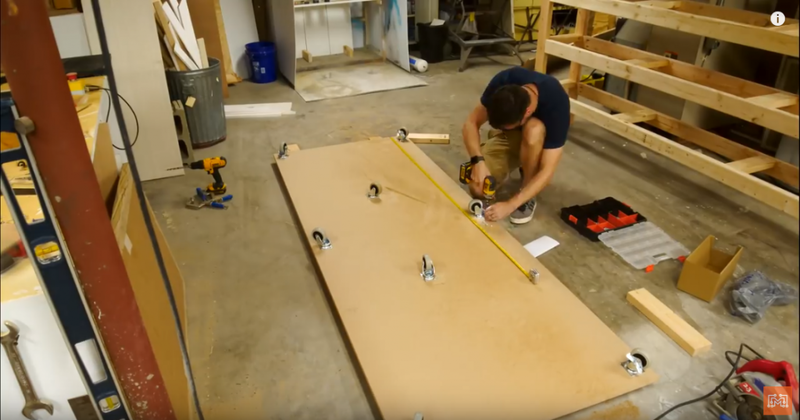 The base of this big lumber cart is made from most of a sheet of 3/4″ MDF. If you live in an area that doesn’t take kindly to MDF, plywood work also work. To save yourself some effort later, you should screw down all of the casters to the platform first. Next, flip the cart over and attach the front fences on either side of the platform with screws from the underside. These fences will keep the lumber and the plywood from sliding off the cart. Last on the list to complete the platform are the two short pieces that connect the lumber fence to the tall storage tower that you’ll assemble in the next step. To give the cart some height to support the leaning plywood and to horizontally store longer pieces of lumber, we’re going to build the center tower structure. 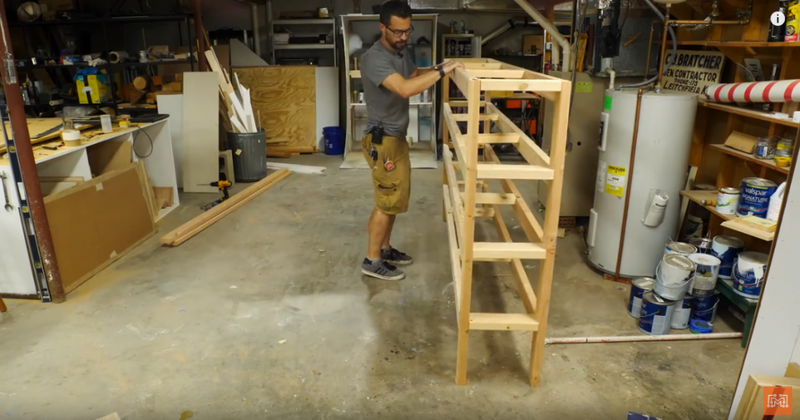 This consists of 2x4s pocket holed together to form a skinny bunkbed-looking shelf system. I cut a small spacer block to keep my gaps consistent and it worked really well. After building the two upright assemblies, I connected them with 16 short horizontal supports also using pocket screws. Now that the storage tower is complete, I set it onto the rolling platform and secured it to the front fence and to the platform itself with…you guessed it, pocket screws. Now at this point, the cart totally functions as a storage solution. I wanted a way to help segregate items, both inside and outside, so I added some inexpensive sheets of 3/16″ luan to the tower faces. 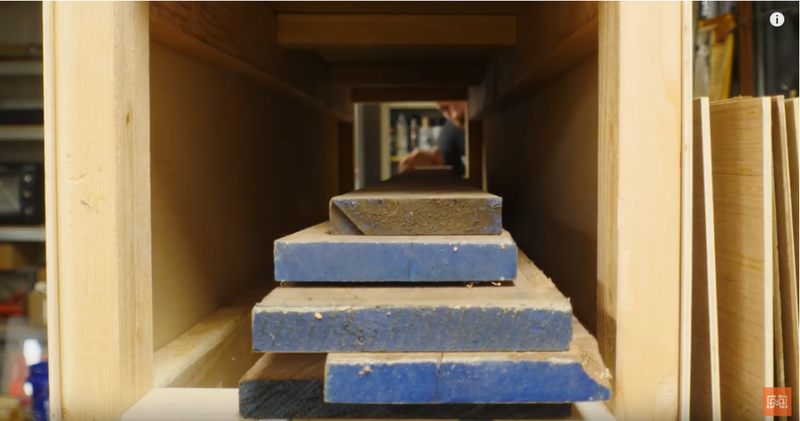 This keeps the lumber inside where it belongs, keeps the plywood from interfering with the interior storage, and gives the lumber somewhere to lean on. I also plan on adding some dividing rods to this face later. To keep my different pieces of offset lumber together by type, I wanted to add some moveable dividers to the face of the storage tower. I began by drilling some 11/16″ holes to receive some 1/2″ metal conduit that will act as dividing rods. This evenly-spaced grid of holes will allow me to move the rods around to accommodate different sized items. Josh and I loaded up the cart with all of the full sheets of plywood we had including marker board, sheets of plexiglass, MDF, and other large sheet goods. We stocked the interior spaces with long pieces of hardwoods and dimensional construction lumber. 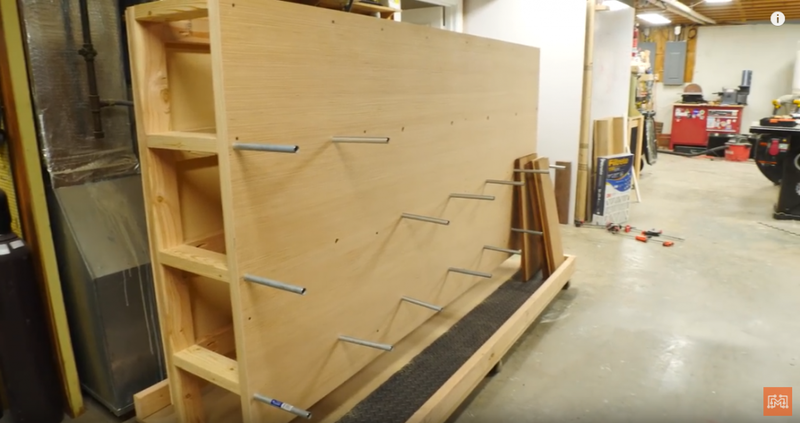 The front face with the dividing rods allowed me to organize all of my medium-sized offcuts of walnut, cherry, teak, maple, and other taller items like PVC pipe and dowels. 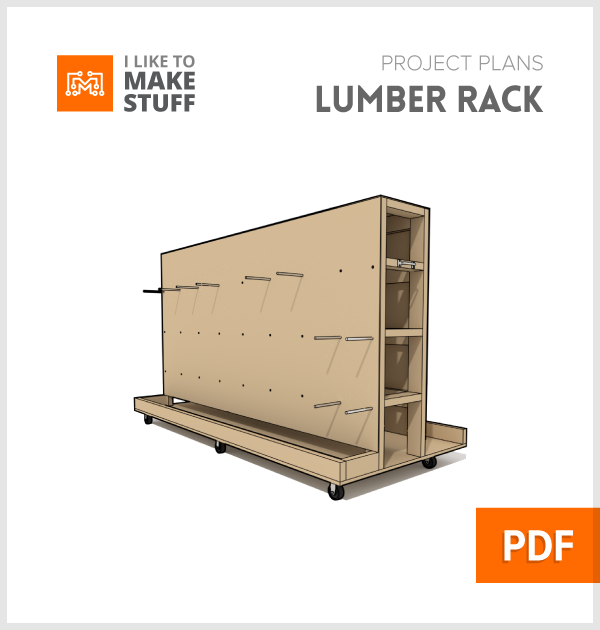 How to Make a Rolling Lumber Storage Cart- Load It Up! I really like this new storage cart. 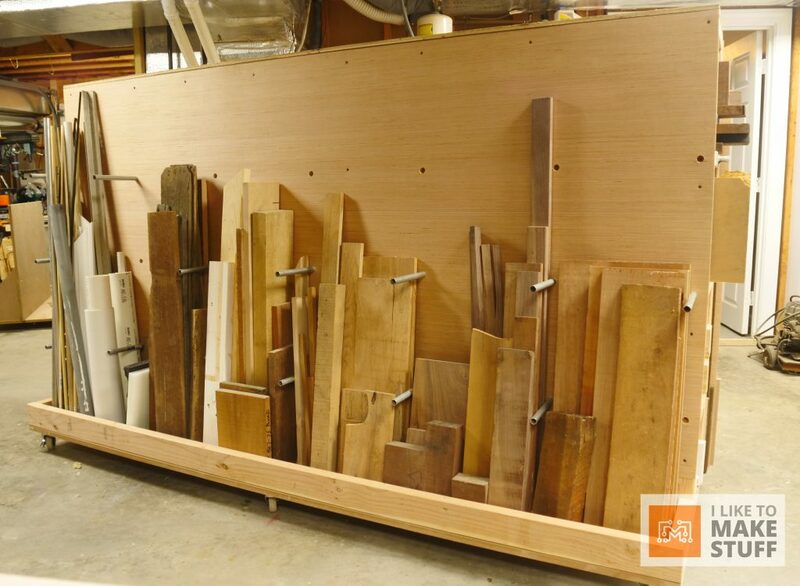 It is a centralized place to find all of our woodworking materials. When we are planning a project, I can locate the cart and instantly know what materials we need to get. Before, our sheet goods were leaning up against the wall in one area, and the lumber was roughly organized in another. Having one shared organization and stockage system is really beneficial. And if you want to make one for your shop, use the link below to get a set of plans.